Review: It's been just under a year since vampires announced their existence to the world and they are currently enjoying a celebrity status. 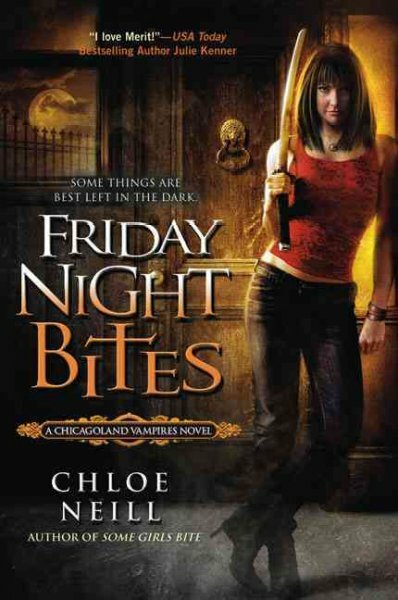 However, a reporter has discovered a secret some vampires don't want humans knowing about-raves where vampires feed on people. The reporter is an old family friend of Merit's, so she seeks to reconnect with her estranged, wealthy family to maintain public relations between the vampires and humans while also keeping tabs on the "story." Meanwhile, Merit is still struggling with her transition to becoming a vampire and her growing attraction to Ethan. Her best friend (and sorceress) Mallory struggles with her own newly discovered powers while Mallory's boyfriend (and Merit's trainer) Catcher Bell, moves in. To give them privacy and to better serve her house as guard and Sentinel, Merit moves into Cadogan house. Hmm....I had high hopes for this book. Merit is written as extremely sarcastic which can be amusing, but I was hoping Neill would do a better job developing Ethan. It is rare that I am rooting for the (obviously main couple of the series) to fail. And although Merit is supposedly 27, she acts and speaks closer to 19. Cadogan house is essentially a fraternity/sorority house and almost all of the occupants (even though 100s of years old) speak slang like they are teenagers. It just did not ring true. I also feel like Merit's main friends, Mallory (sorceress) and Lindsay (vampire) are interchangeable. The way they speak is almost identical. Another gripe is that Merit is a house guard with extremely strong physical ability...but she rarely fights anyone. This was an okay read, but it was frustrating because this series has the potential to be so good..and it just misses the mark.